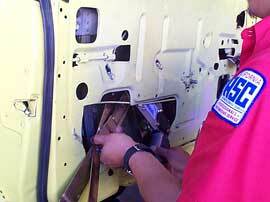 The installation is started by carefully removing the handles, pull straps and trim panels from the door panels. 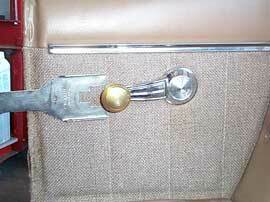 Using a door panel clip tool or similar tool, the door panel is carefully pried off of the door. Care must be taken so that the 30 year old panels aren't broken. If the paper liner is still there, it should be carefully removed, so it can be replaced later. The manual regulator is unbolted from the door and the glass sash is unbolted from the window. The manual regulator is then removed through the large hole in the door. At this point our installer checks the integrity of the glass channels, guides and rollers. Any worn components are replaced at this time. 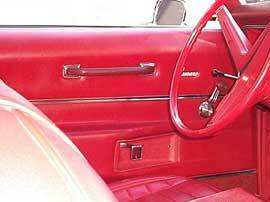 The window must move smoothly in the door before installing the new regulators. 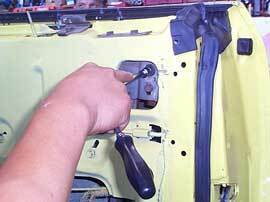 The Electric-Life power window regulator is then inserted into the door. This kit completely replaces the manual assembly. The 2 rollers on the new regulator slide onto the rail in the glass channel. The regulator is loosely mounted to the door. 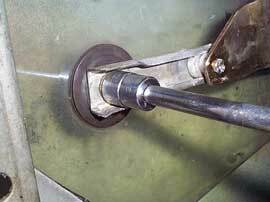 The short rail on the door (Just above large hole) is removed and placed onto the remaining roller. This rail is then bolted back onto the door in the same position it was taken off in. With the regulator, glass sashes and channels lined up properly, the nuts and bolts on the door and glass are all tightened. Notice that the new regulator mounts completely towards the center of the door. The holes and area where the crank handle was are now empty. This is one of the many adjustments that Camaro doors have. You can adjust the height of the glass in the front and rear of the window. The inward kick can be adjusted. The angle of the glass can also be adjusted. In order to have your windows work properly, all of these adjustments must be correct. 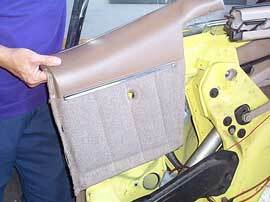 To install the power window kit in the rear, the rear seat must first be removed. 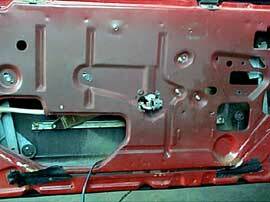 The lower part of the panel is unscrewed and removed, then the window crank handle is removed. The panel is carefully pulled out and up out. This convertible model had an inner metal cover that also needed to be removed to gain access to the regulator. 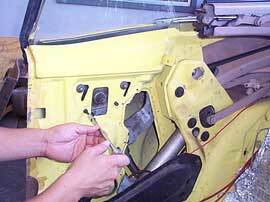 The original regulator is then unbolted from the quarter panel.